Dear little birds and your painting is fabulous! 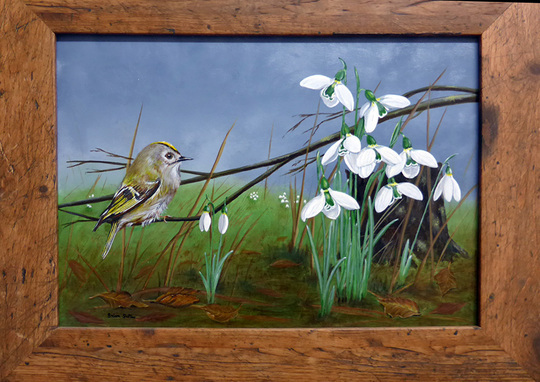 What a beautiful little bird, so envious, also of your painting talent, Brian. 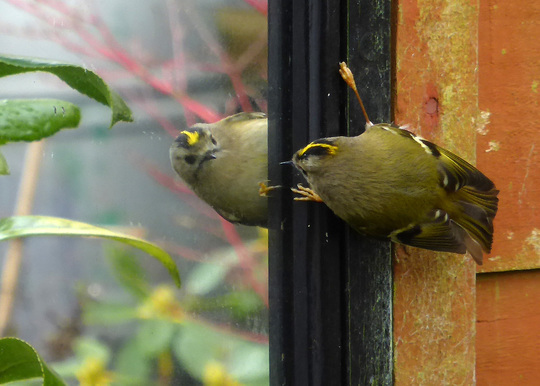 It's lovely to see a pair well caught on all photos I ve often wondered what birds think when seeing their own reflection. Wonderful painting with so much detail. I don't know what's the best - the real photos or the drawing. All wonderful - what a pretty bird! Aw...this is abrilliant blog! I have never seen this bird..ever! And I do love birds. Love the photos and the painting is super, I love it too! Made me so happy. I'm definitely going to make some feeders over the next few weeks. I live in an urban area and it saddens me that our local birdlife is so dominated by magpies, pigeons &, dare I say it, darned moggies. I've got a clever remote control for my camera so I can put it on a tripod & point it at the feeders then sit indoors & see what's in the frame, fire the shutter, etc. on a tablet. The smallest bird in Europe Brian! I hope I shall see it one day. 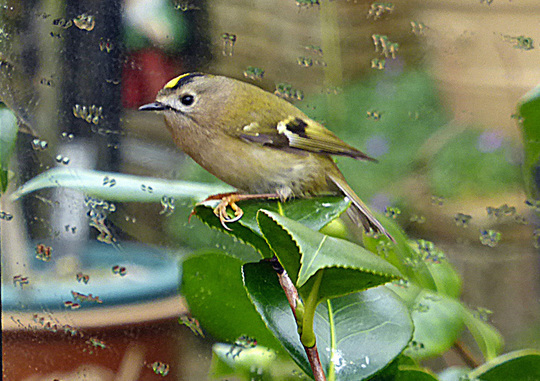 Lucky you to have them in your garden ... such pretty little birds. Love the painting too. 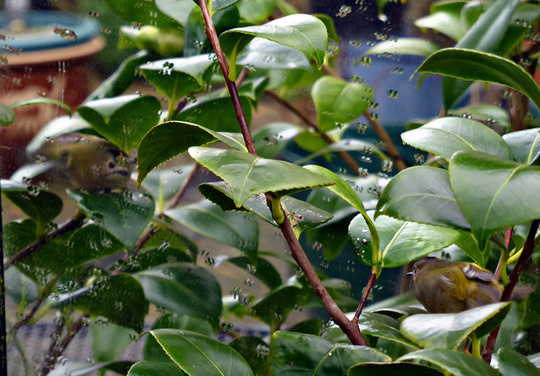 LincslassIt is so tiny, they are still around so hope they nest close, long as they keep out of the reach of squirrels. The Owl Trust has a box at the bottom of the garden squirrels have torn pieces out of that I think they will take it down in the hopes the birds will find a safer place. You really are a multi-talented man, Brian! 😀 Not only do you grow fabulous plants but you are very good photographer & probably an even better painter! 😀 The photos & the painting are just so good! Balcony never think of it like that I am just enjoying my retirement doing the things I enjoy. I just hope I get to see some chicks they will be so tiny. WOW!!! 😱 That is small!!! No wonder most of us have never seen this bird! Would that make her smaller than a Wren? I've seen Wrens on occasions near here. I loved your blog Bjs . 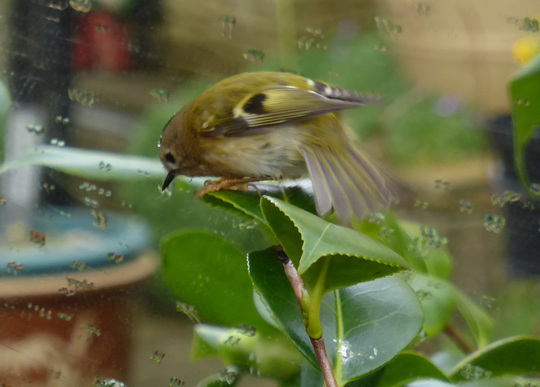 I have only seen a gold crest once and that was over 20 years ago when one got stuck in the green house and my hubby cupped it in his hands and very carefully let it fly away. Do you ever find that birds crash into the mirror ? Your picture is amazing ! 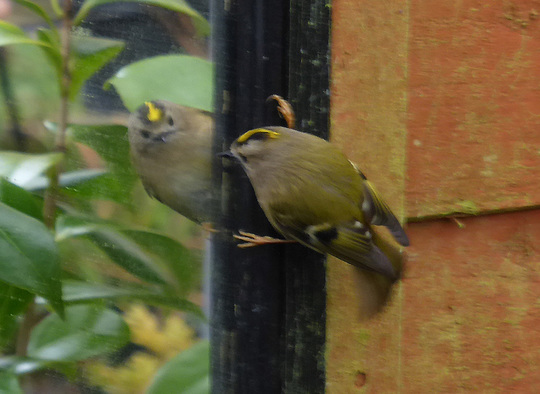 not the mirrors .they crash into our back of the house windows occasionally with spectacular images of the bird left on the glass from the oils in there feathers,fortunately have never seen one injured,there seems to be certain times when the windows reflect like a mirror.